A few months back, wound up doing some research on some gardening and wound up running into information about Garlic. It seemed easy enough, so figured let’s give it a try. Let’s see what we came up with? Starting off, the idea came from watching one of ‘The Rustic Garden’s videos. The gentlemen in the video named Gary explained the process of growing garlic, and that’s what was used as a template for this experiment. These garlic cloves were planted eight week ago or so. We are in growing zone 7B. Garlic falls under the fall growing season for the most part. The pot that the garlic cloves were planted in were 12 inch high, and 16 inches in diameter. 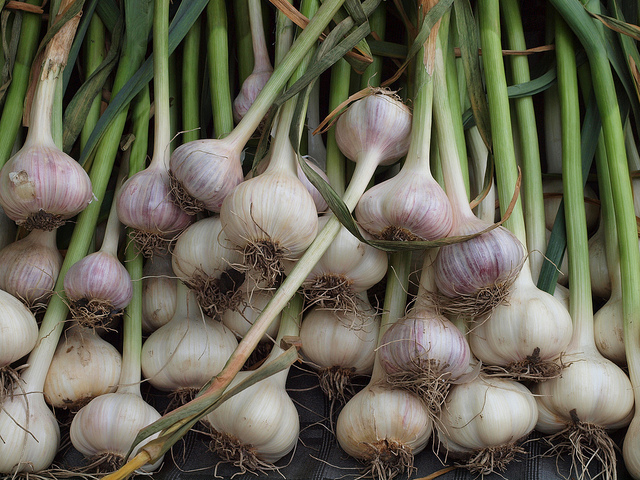 The garlic bulbs should mature between March and Mid June. These particular garlic bulbs were sourced from Sprouts and are of the organic variety. First in the process, you want to take the paper off the outside of the garlic bulb . Then, you will proceed to break the bulb apart into individual cloves. The largest & best looking cloves are the ones you want to plant. The pointed side is where the green is going to come out, and the opposite side is the one that will be done as the root side. Make sure to use potting mix for growing Garlic. After that, the cloves should be buried 2-3 inches deep, and anywhere between 3-6 inches apart. And as mentioned before, these were planted in a pot. Garlic will want to be kept in until the soil temperature is around 45-50 degrees. The garlic greens can be chopped up for salads and also they can be used for stirfry. Have you ever attempted planting garlic? If you have let me know how the experience was for you. Definitely look forward to see how these little guys grow. Time will tell. Starting on October 23, 2015 we opted to follow the tips of the first video provided below, and the following illustration is how the Sweet Potato slips looked after about a month. We figured we would run this experiment now, before next year’s growing season to see what was possible with Organic Sweet Potatoes sourced from the store. As you can see, the one on the right has produced many stalks while the one on the right has underperformed, although this is our FIRST experiment. The second picture below are the stalks as they are going to be kept to see how they grow over the next 30-60 days in order to better ascertain what to expect this year. It’s just an experiment, but we’ll see where this goes.